Deerfield is a major collaborative resource for the business community, local government, non-profit organizations, and for corporate meeting planners throughout the Northeast and there is a venue totally committed to providing a hospitality destination that meets the strategic needs of today’s ROI-driven, budget conscious event planner. More than just a wedding venue in Delaware, Deerfield is a full service corporate meeting space waiting to serve your company’s needs. 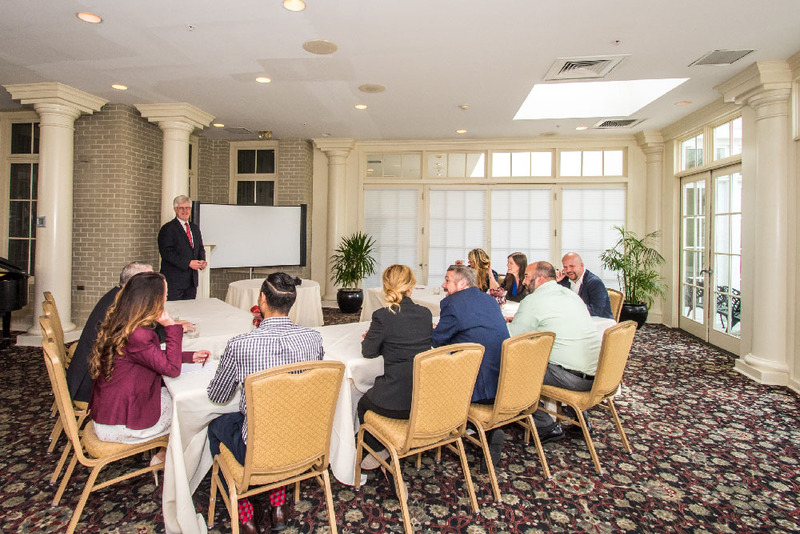 Isn’t it time that your company got meetings “on course?” Meetings at Deerfield are effective, affordable, and designed with both guest comfort and facilitator convenience in mind. Click Here To View Menu Options, or give us a call at 302-368-6640 to begin planning your next business event. We understand business. We know how important investments in events like these are to you and your management team. We can accommodate virtually any size function – from an intimate getaway session for a strategic planning team in the Kent Atrium – to a client cocktail party for 100 on our outdoor Terrace or a pull-out-all-the-stops major reception for 500 in the 10,000-square-foot grand Ballroom. We specialize in hosting hospitality-driven events that re-energize and reinvigorate – returning participants to the work environment refreshed and rejuvenated. Hospitality PLUS! is our exclusive set of uncompromising performance standards that ensure our staff is totally focused on enriching the experience of every guest. Experience the finest corporate events Delaware has to offer for yourself. Arrange a personal tour of this extraordinary venue. Call 302-368-6640 and ask for Catering Sales – or e-mail us and we will get back to you promptly. Deerfield offers access to a variety of meeting spaces, menu options, recreational activities, natural resources, and Delaware’s tax-free shopping, making it the ideal location for your next Team Building Event. We, and our partner hotels as needed, will provide you and your company everything you will need for a first-class function. Combine meal service, conference services, and professional event planning with any one or more of the guest-friendly activities below to ensure a productive, memorable event. Contact the hospitality professionals at Deerfield who can help you design a productive day that is fun, flavorful, and one-of-a-kind by calling 302-368-6640 or Email Us and you’ll be contacted back promptly.